Hosley's Set of 24 White 3" High Flat Top Pressed Unscented Pillar Candle. Great for Weddings, Parties, Special Events and Emergency Lighting. Always trim wick to 1/8" prior to each use for optimal performance. Always use on heat/flame resistant surface and burn within sight. Keep away from things that can catch fire and away from children and pets. 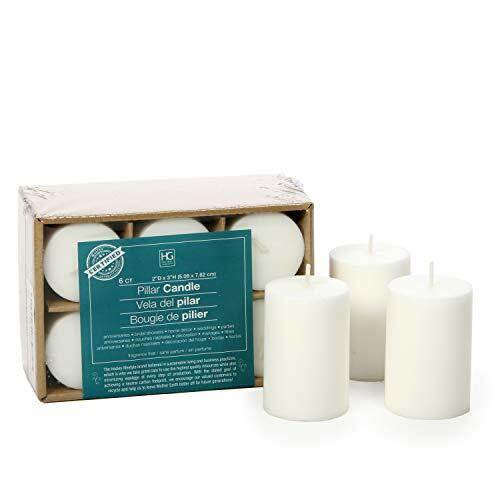 USES: These pillar candles are perfect for: everyday use, wedding, events, aromatherapy, mood lighting, ambiance lighting, and emergency lighting. BENEFITS: These pillar candles will last the duration of most events. When candles used with pillar holder preparation is faster and easier. Once the event is done, these low cost solutions are easily disposable or can be reused for you next event. When using in your home as a decorative accent.